Just about there with the blog catchup: from here on I'll try and update more regularly. 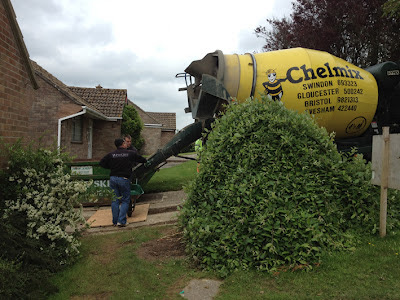 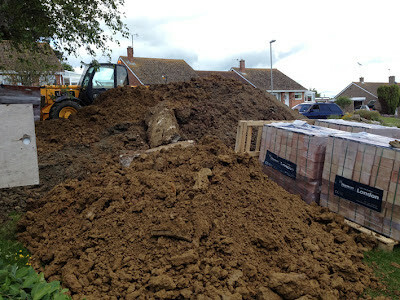 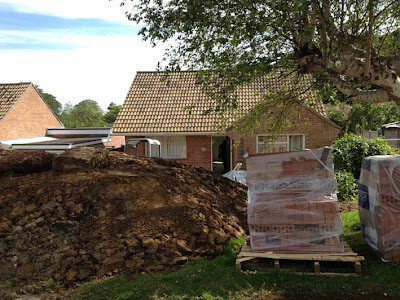 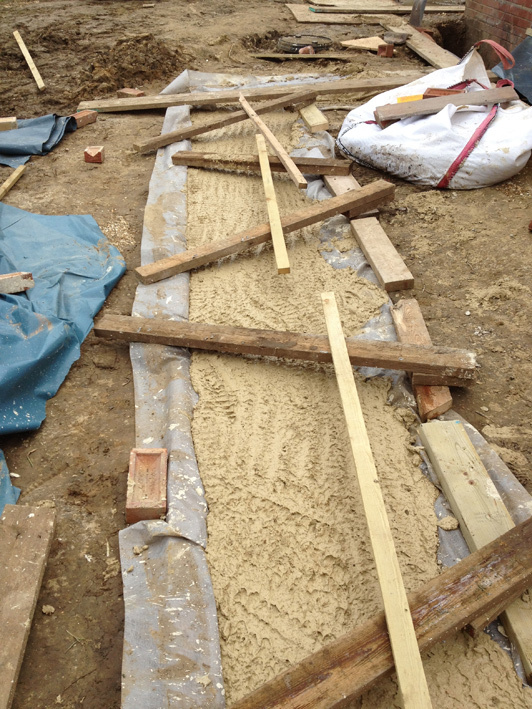 Today's thrilling instalment: cement-free foundations. 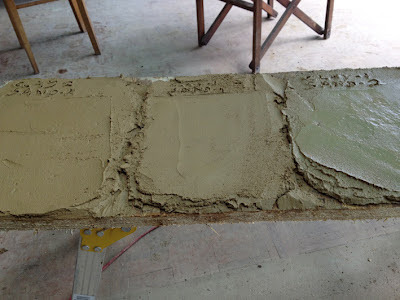 I think I've talked before about reasons to avoid using cement-concrete (I'll check and rectify that if I haven't), but in brief: cement has a very high embodied energy and very large amounts of C02 and other pollutant chemicals are released in its production. We're using compacted gravel and limecrete - lime requires less energy to produce than cement, less CO2 is released in its production, and it then re-absorbs some of that CO2 as it cures and carbonates. 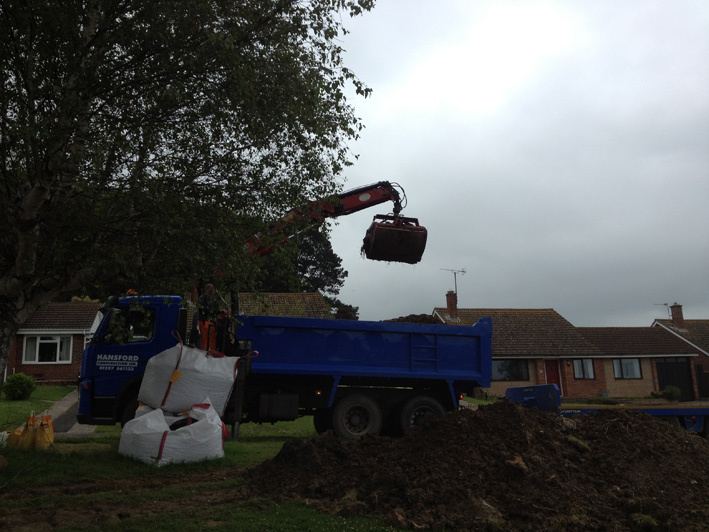 Clearing the mud left at the bottom of the foundation trenches after days and days of torrential rain. 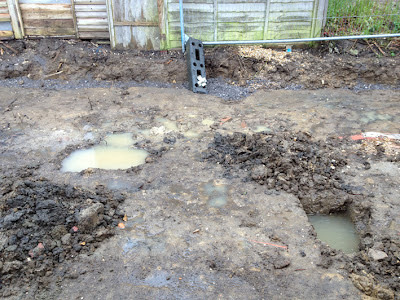 I'll try and make sure the next foundations are filled asap after being dug... 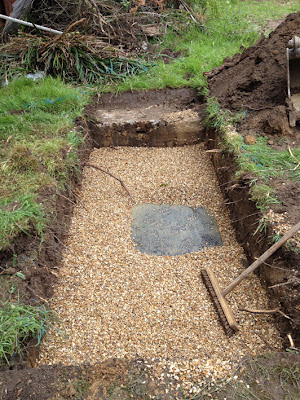 Note 'tide mark' from water level, about a foot up. 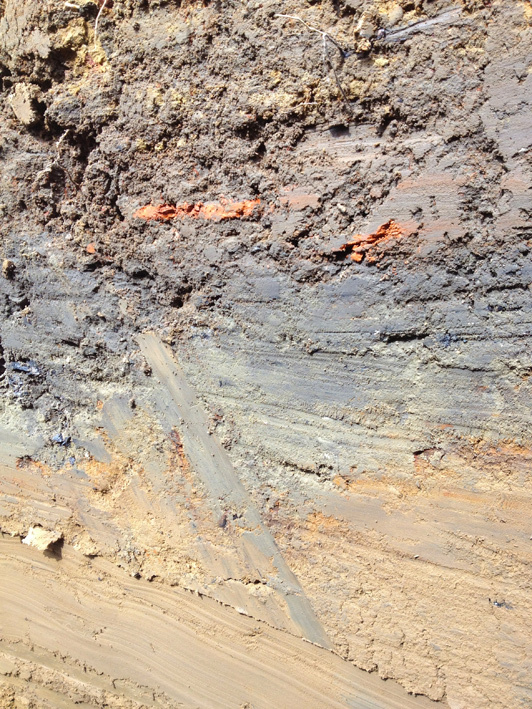 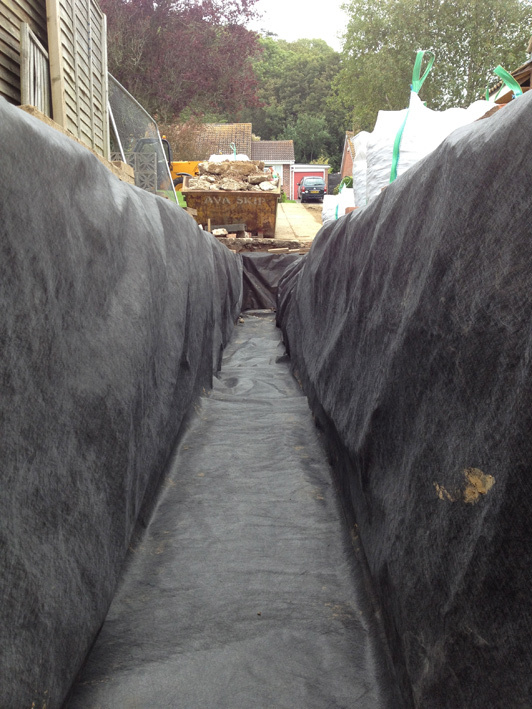 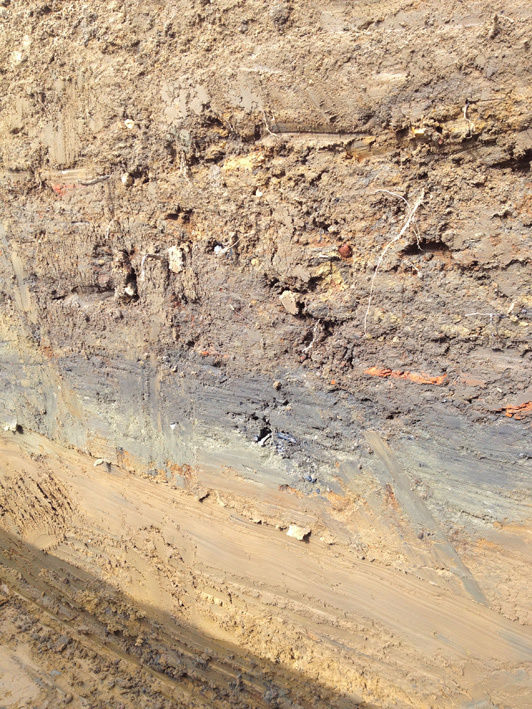 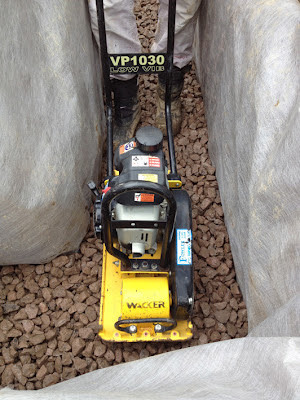 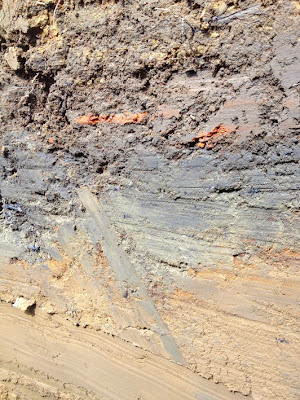 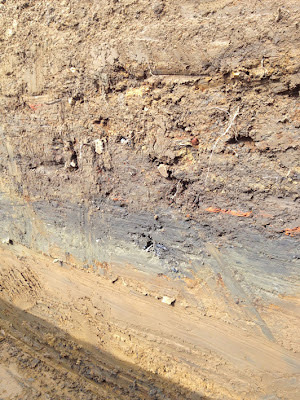 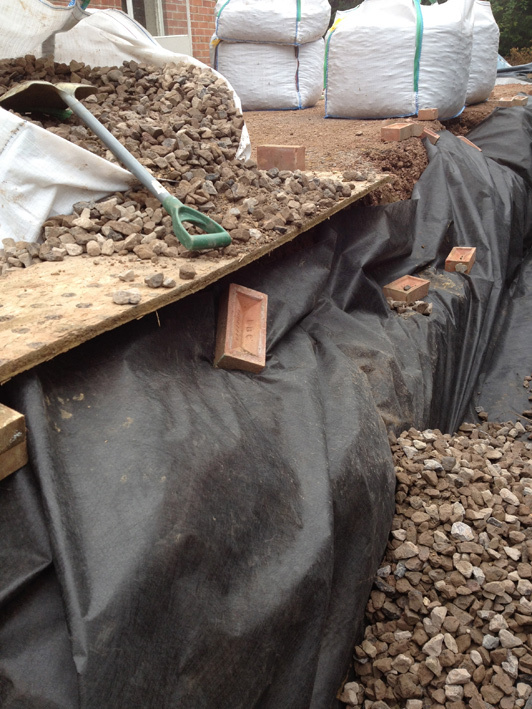 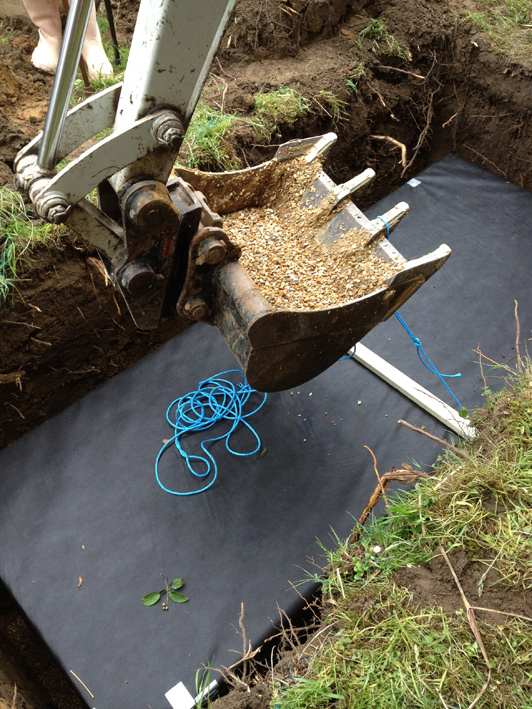 Geotextile lining the trench. 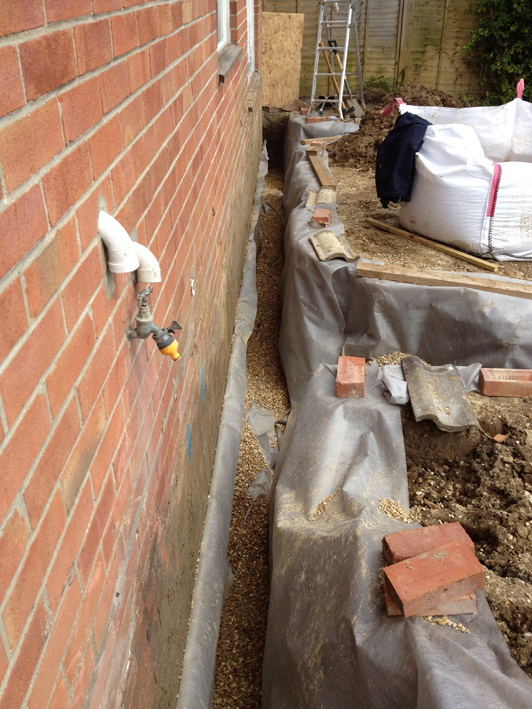 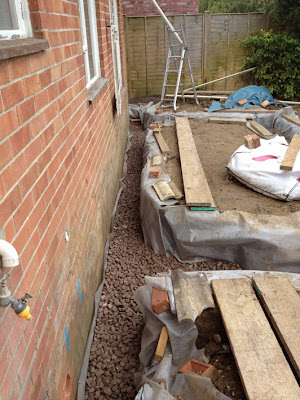 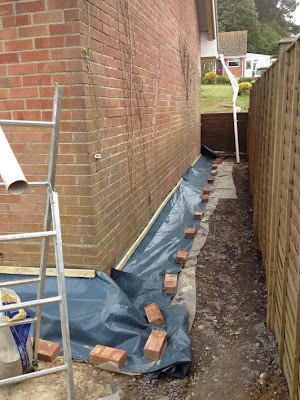 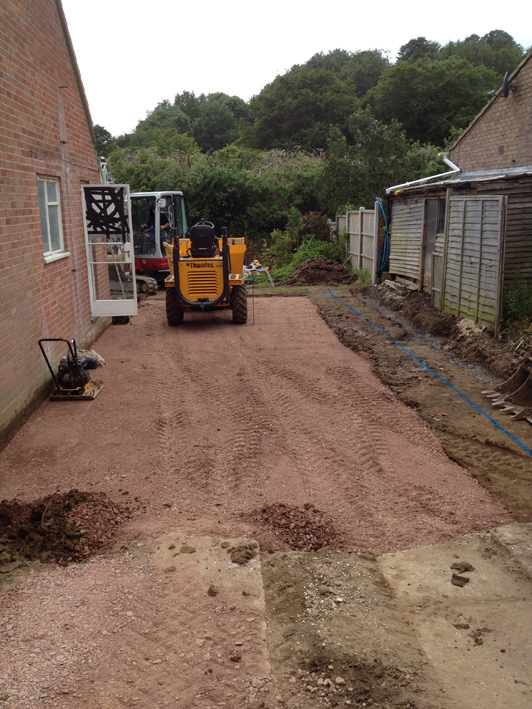 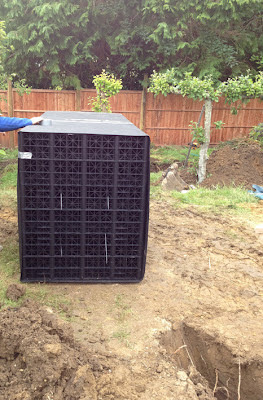 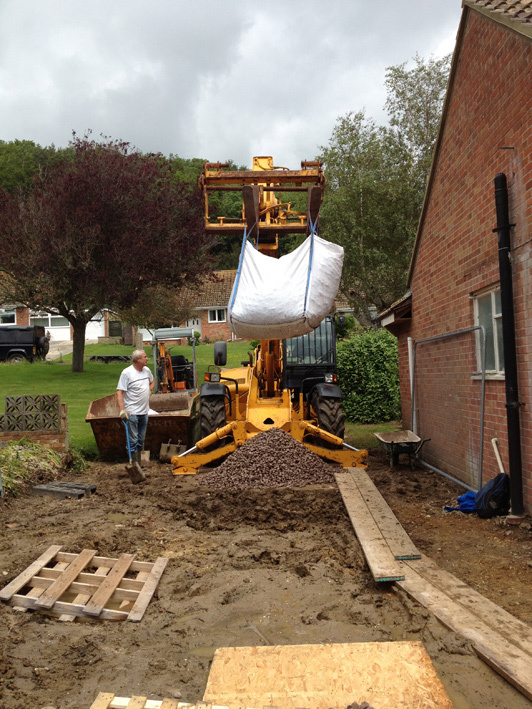 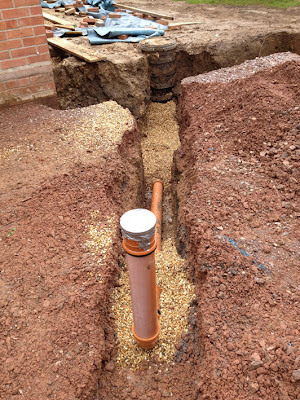 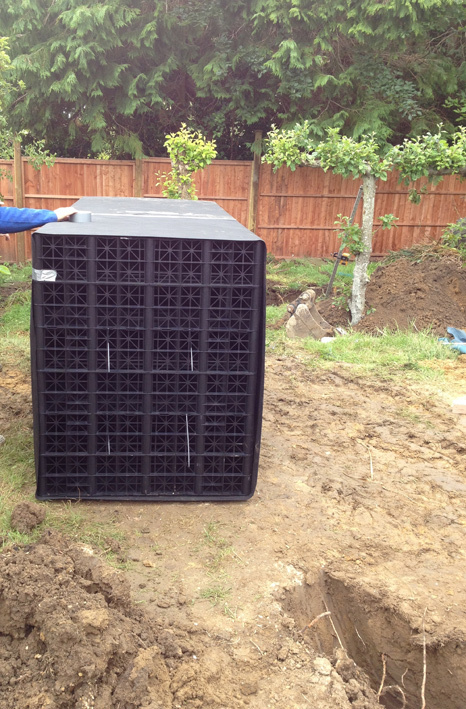 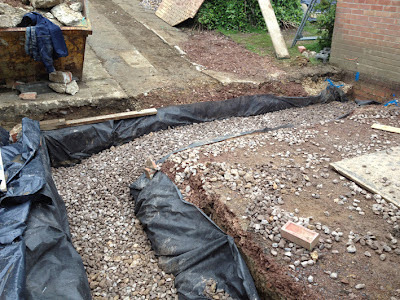 This will prevent the clay-soil from permeating through the gravel infill. 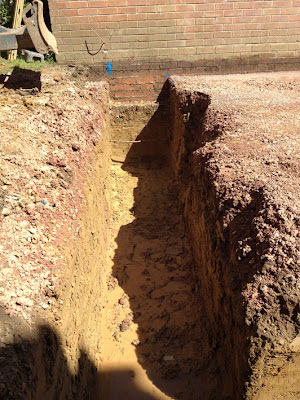 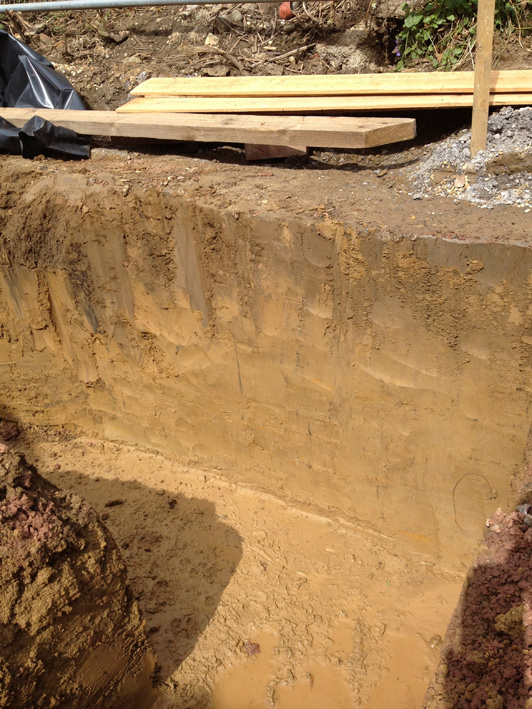 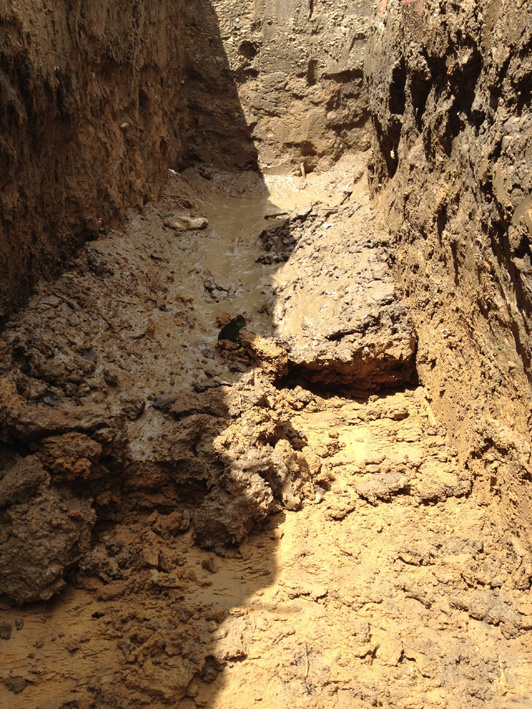 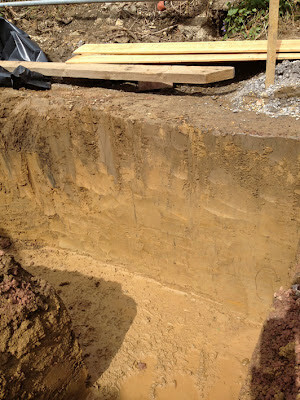 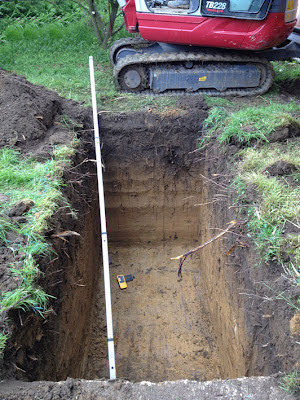 Clay soil tends to moves as it expands/shrinks when it gets wetter/drier (this is why our foundations had to be so deep). Whacking with a wacker. 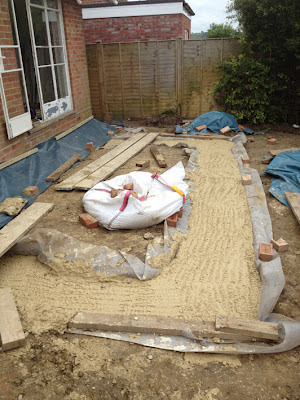 Compacting the gravel in roughly 150mm layers. 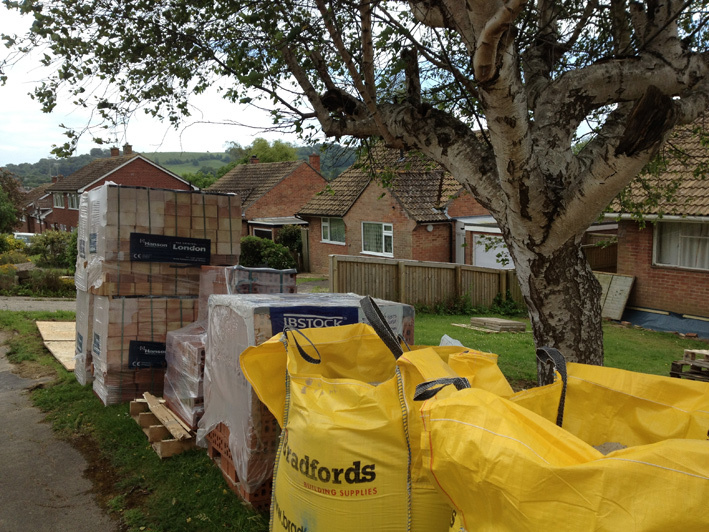 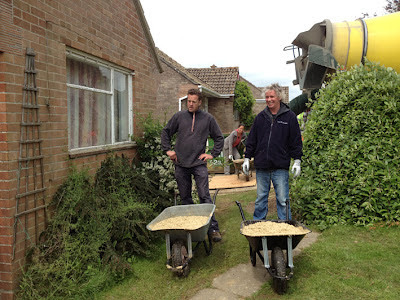 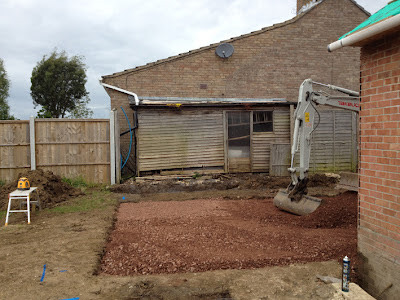 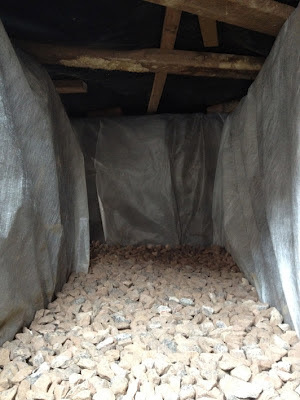 The gravel is known as "40mm clean" meaning there's no dust or fine particles, which could produce similar unwanted result as clay particles getting into the foundations. 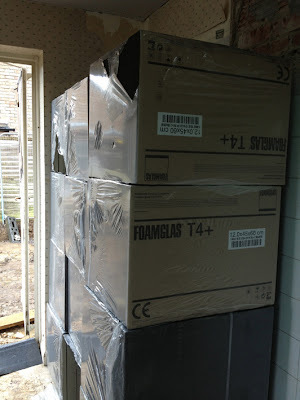 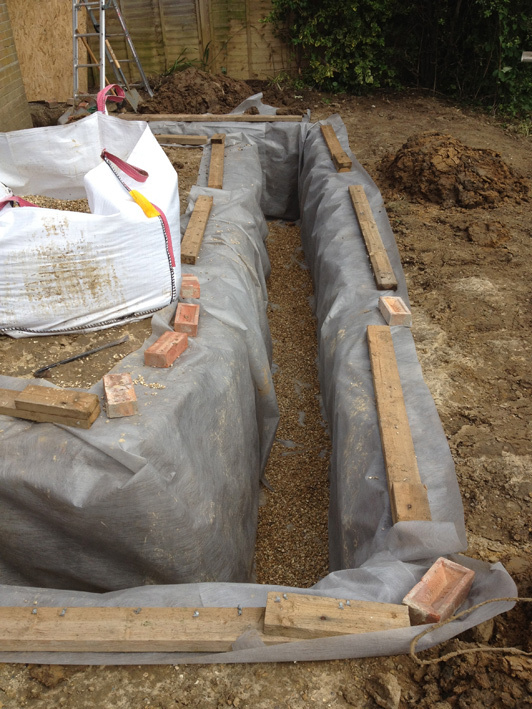 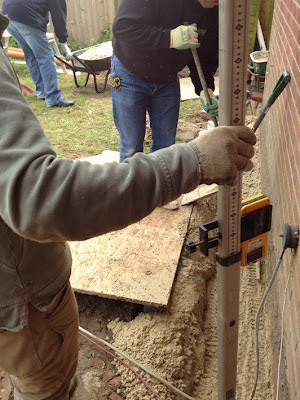 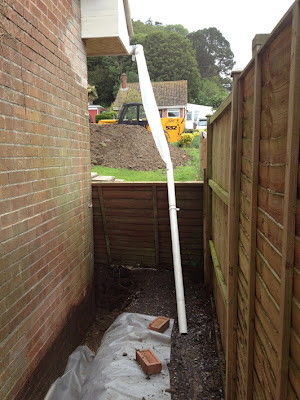 It also allows the foundations to be draining. 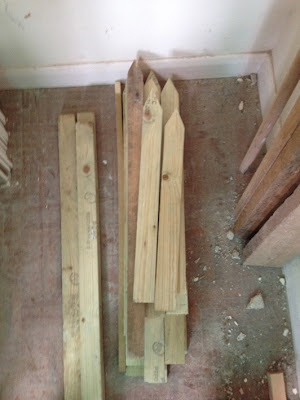 Cores from core-drilling the wall. Left hole is for the drain from the bathroom and utility room, right hole is for the service pipe from rainwater harvesting tank. 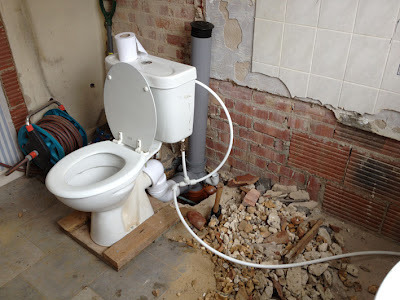 After about a week with no loo, I reconnected it in roughly its new position, into the new drain. 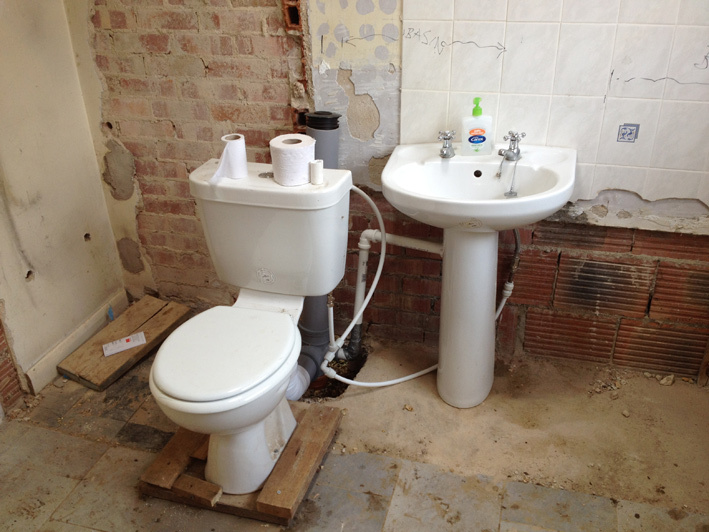 Not worried about neat plumbing at this stage... 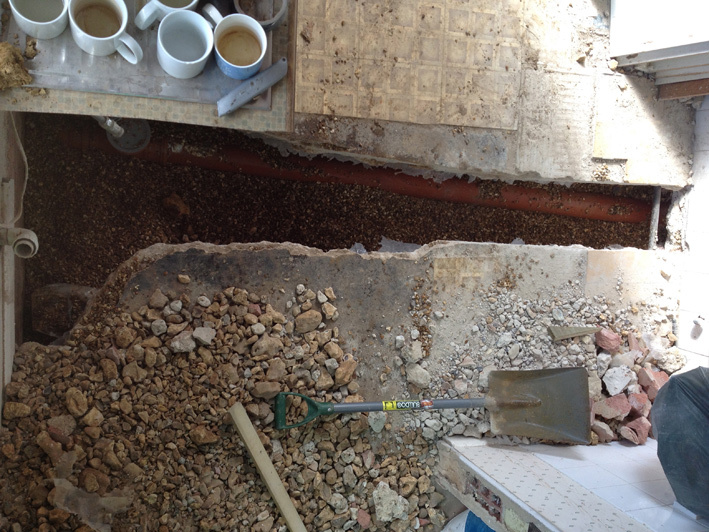 Still hoping to replace the water pipe that enters the house anyway. 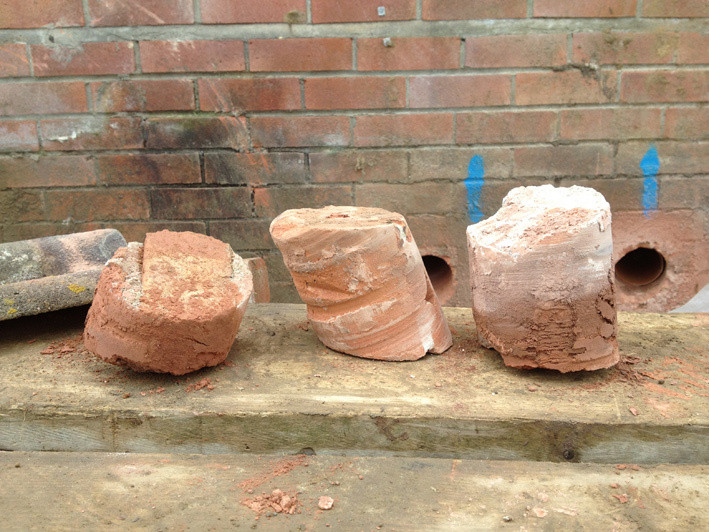 Current one is corroded and unlikely to last as long as we'd want. 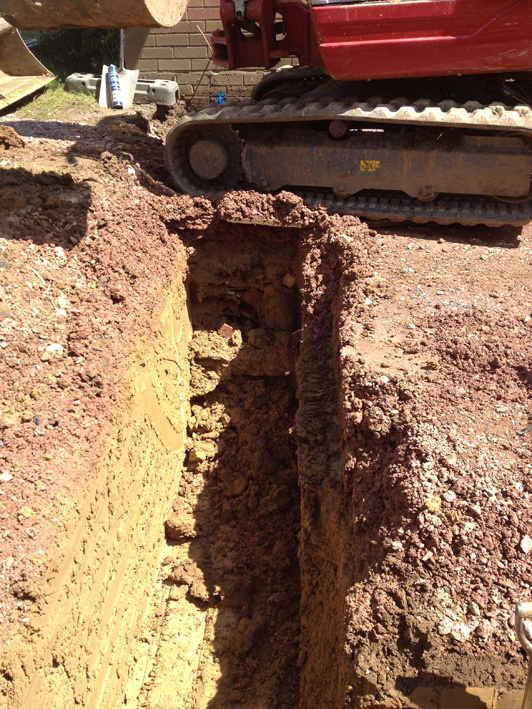 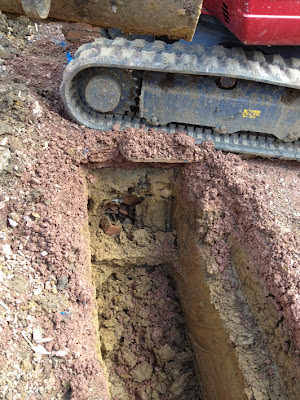 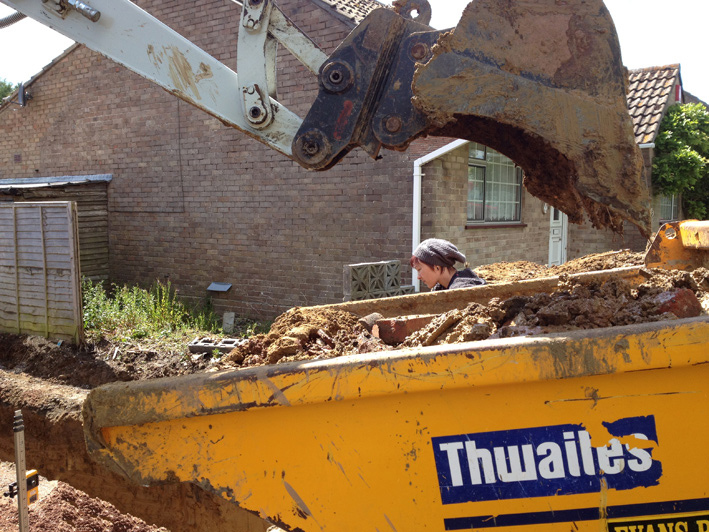 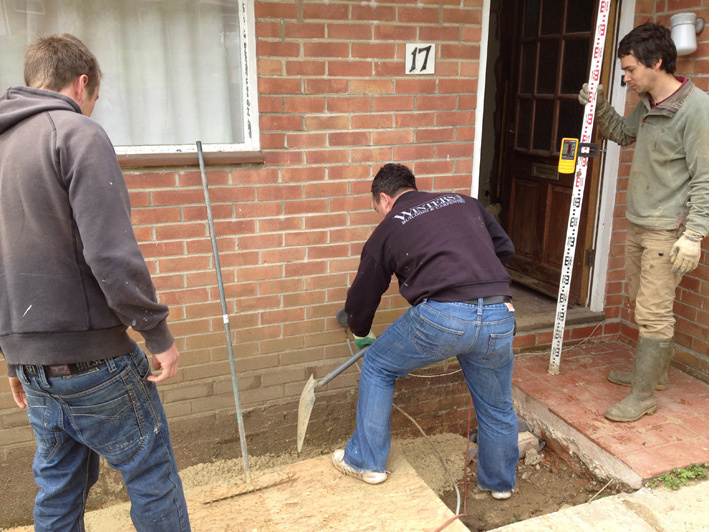 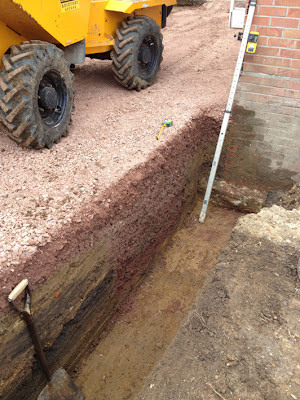 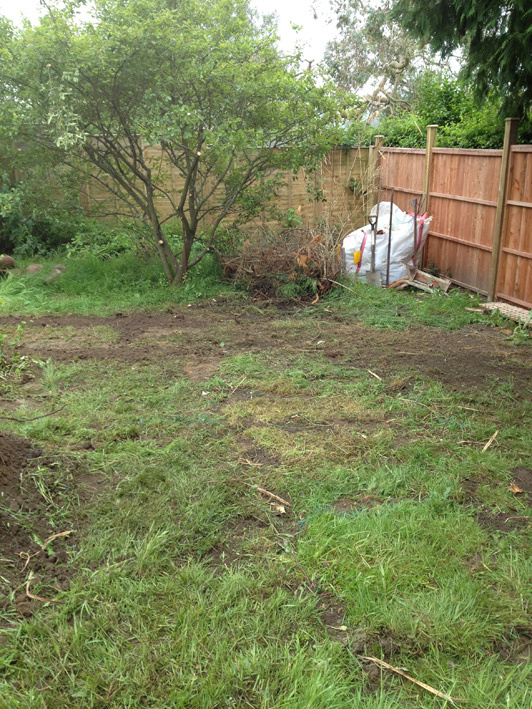 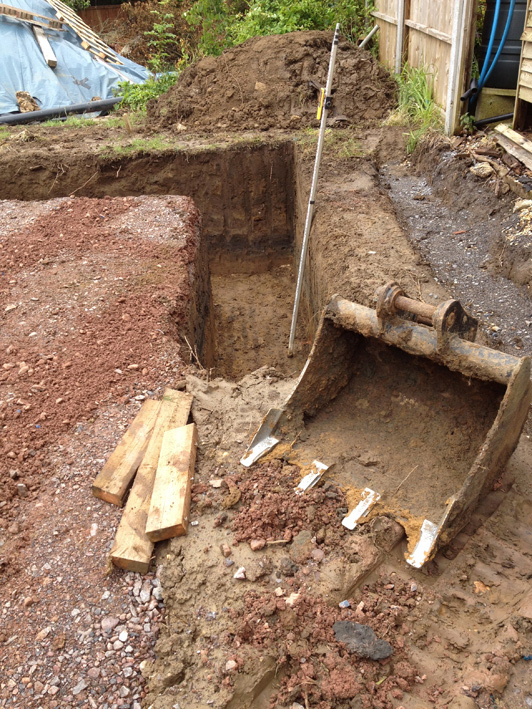 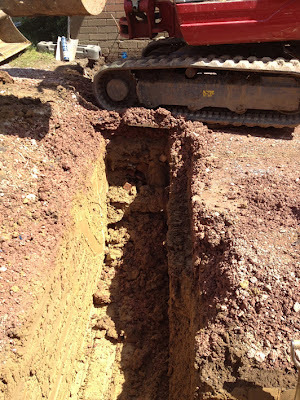 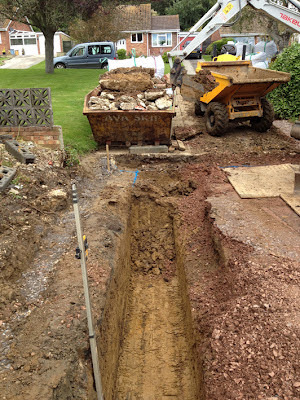 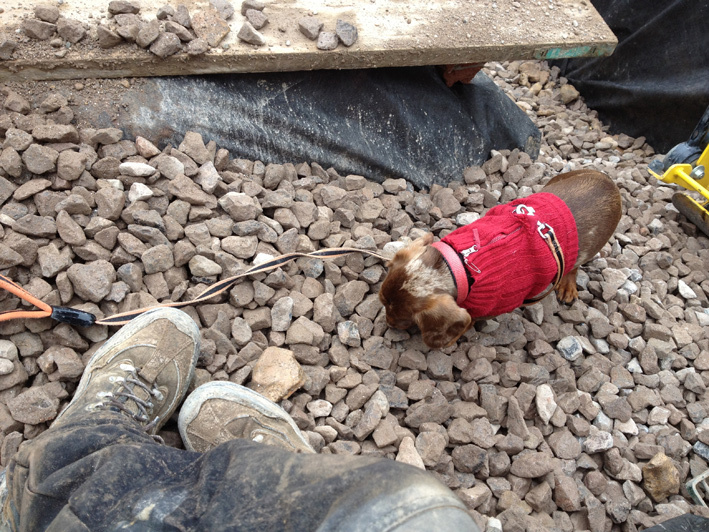 We should find the main underground pipe once we dig out the extension footings. Aerial view of new drain from bathroom. Coffee cups showing need for the sink to be reconnected. 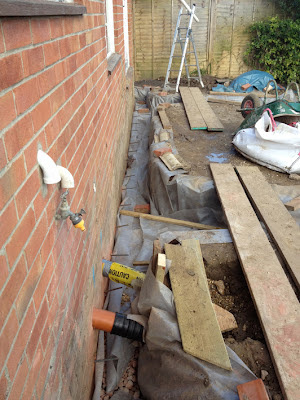 Short lengths of rebar (reinforcing bar) embedded into the bungalow wall with resin, to tie the limecrete to existing structure. The was a dearth of the correct size of rebar in town. Getting it sorted involved a trip multiple builders merchants, returning to one a second time, armed with bolt-croppers I'd just had to go and buy from another supplier, in order to cut the rods to a size that would fit in my car. Drain and service pipe entering bungalow below floor level. 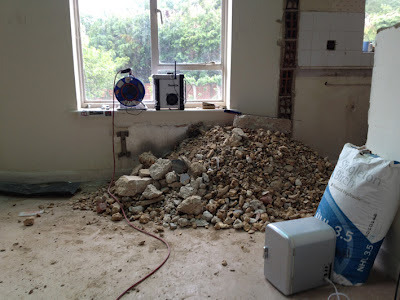 All of this was inspected and approved by the building inspector just before limecrete arrived. 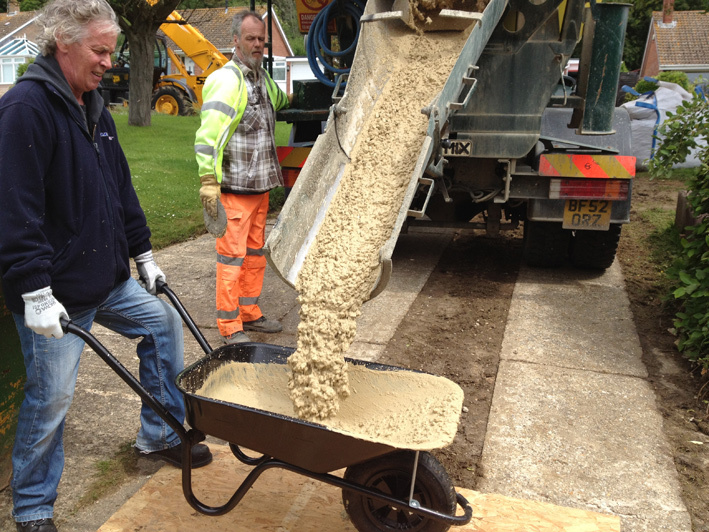 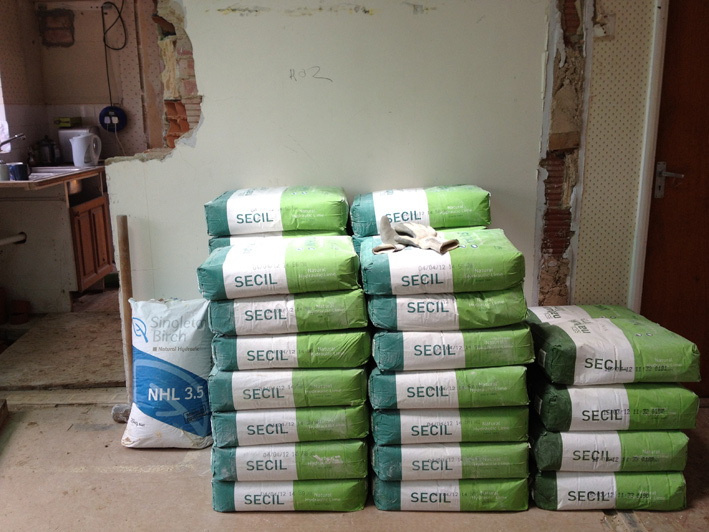 Ready-mix limecrete. Not as local as I'd like, but the nearest available (possibly the only supplier of premix limecrete outside of Norfolk). It saved me days of mixing small batches. Checking limecrete level with the magic beepy stick (laser site-level, wonderful bit of kit I will never own). 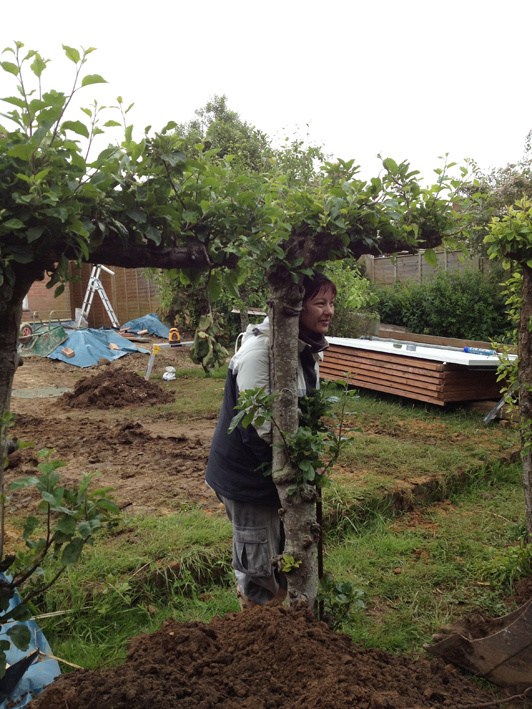 Me hunching over the beepy stick, my sister Caroline hunching over a barrow of limecrete. 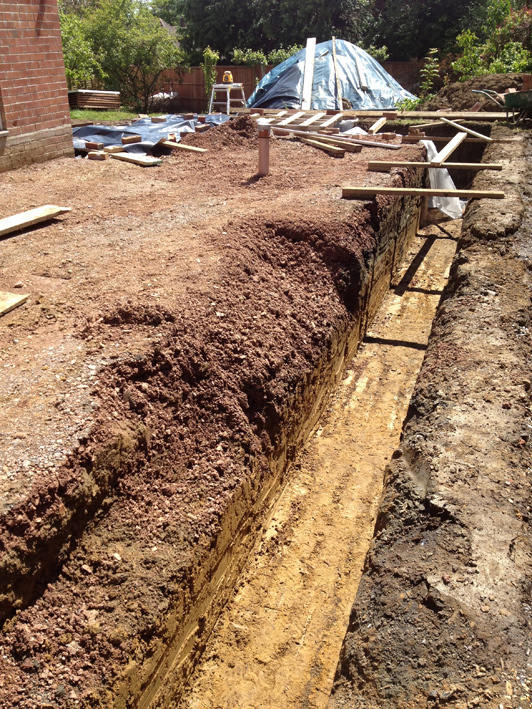 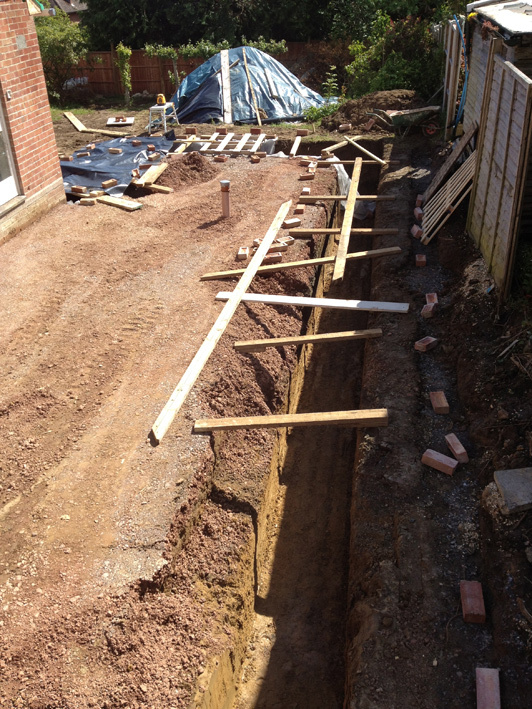 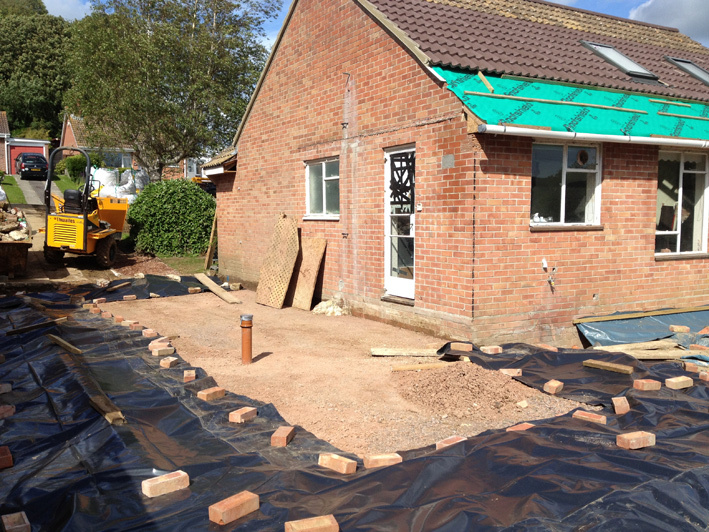 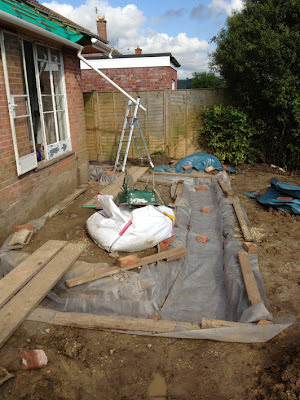 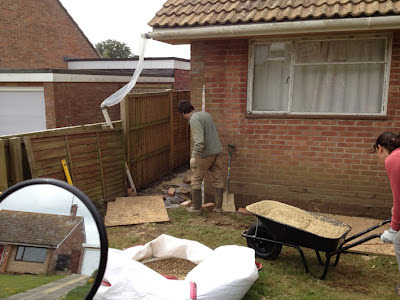 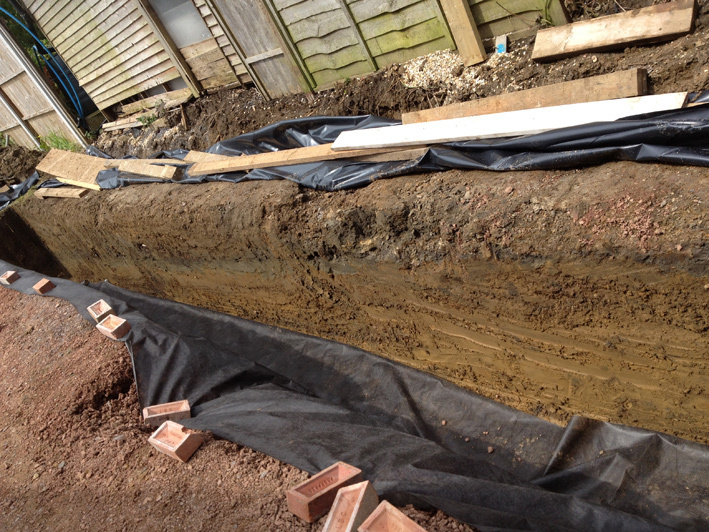 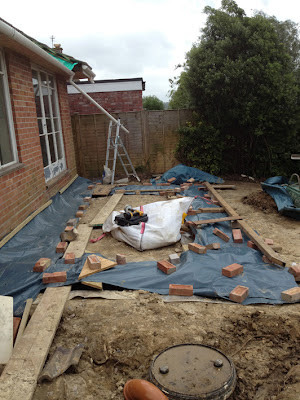 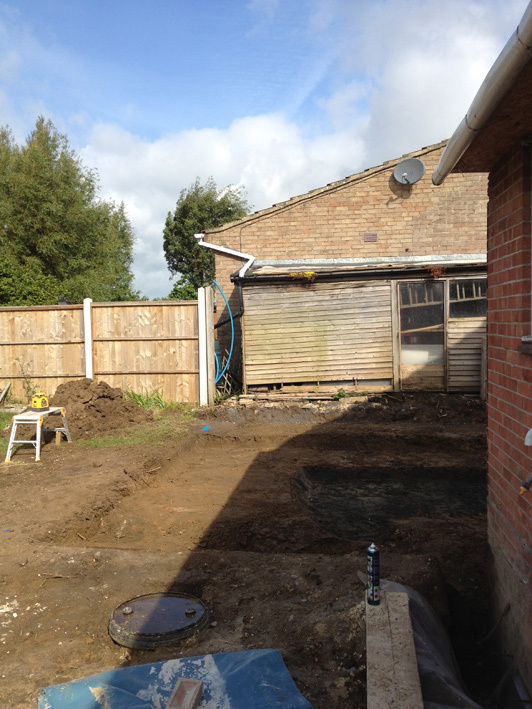 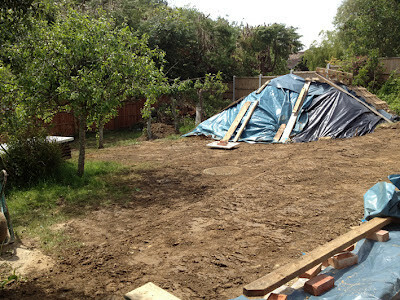 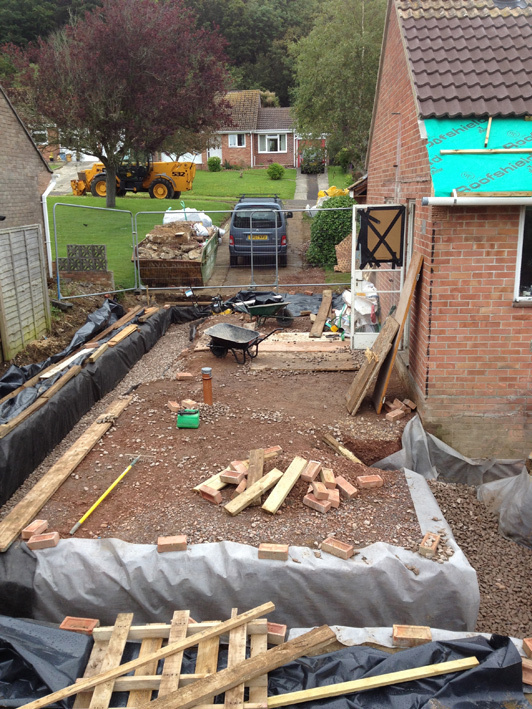 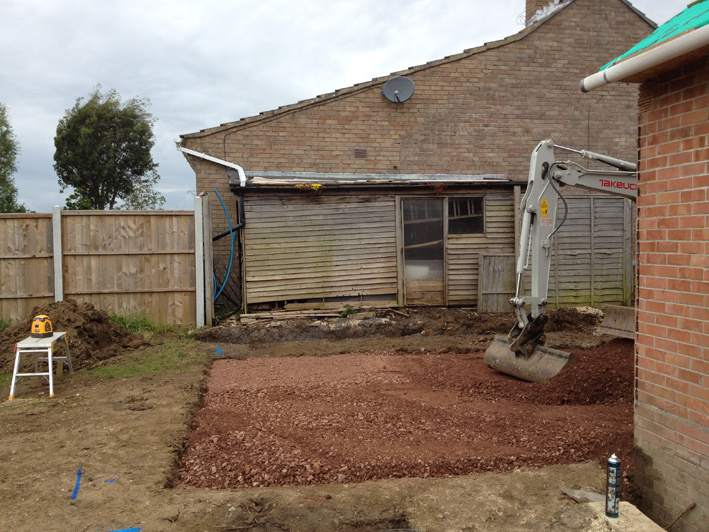 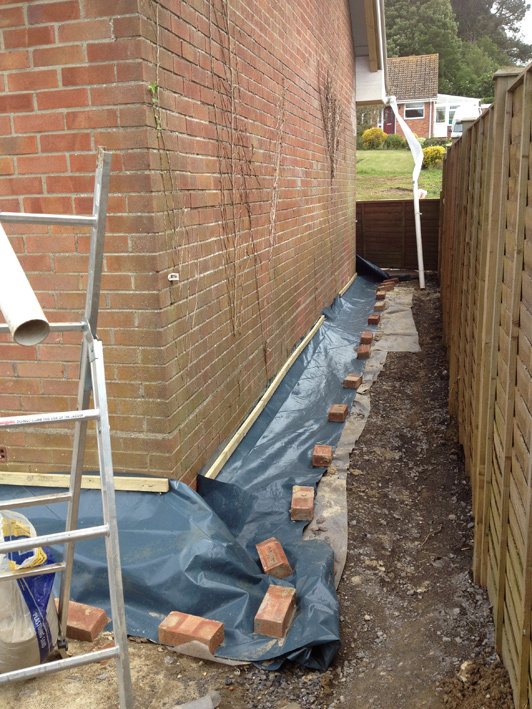 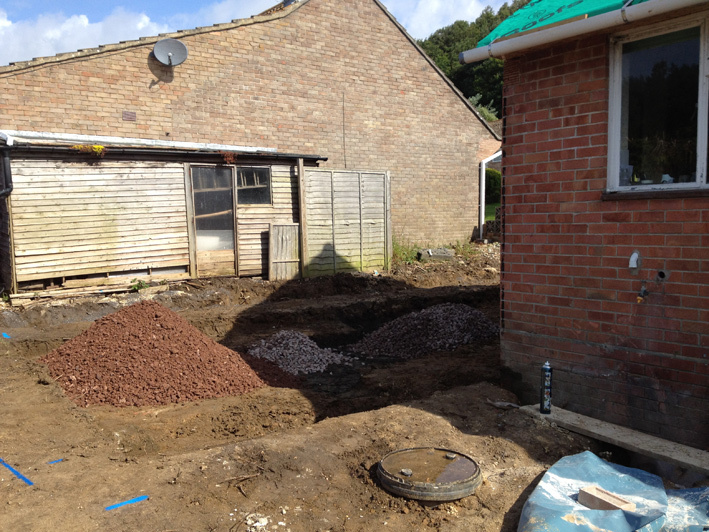 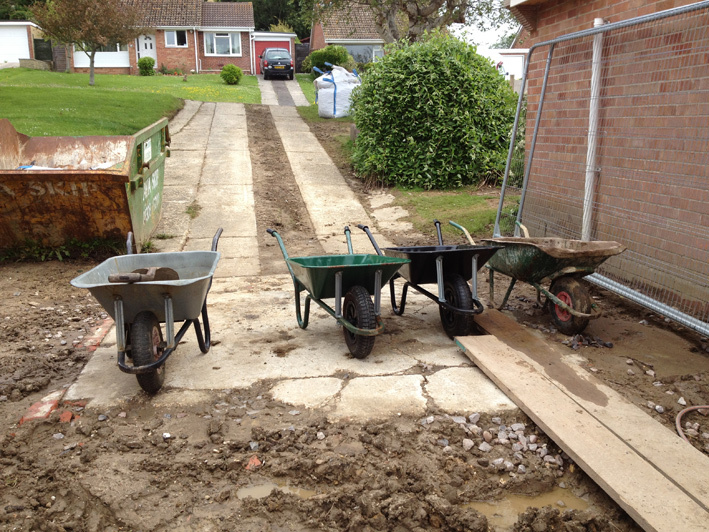 Conservatory foundations. Some last minute shuttering was needed here as the ground was a bit lower than intended. Fully be-skirted bungalow. 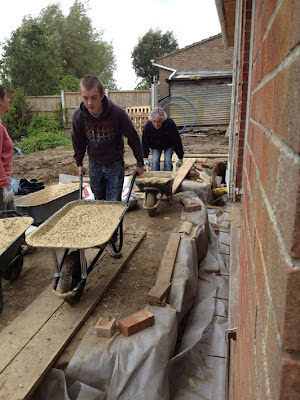 Re-using the plastic that functioned as temporary roof covering earlier in the build.